The latest released version of Whitebox GAT (3.1.3) has greatly improved feature selection capabilities, including feature selection by attributes built directly into the vector attributes table. The following post is a brief tutorial to guide you through the process of how this works. To select features based on attributes contained with the attributes table, first be sure that the vector layer of interest is selected as the active map layer in the Layers tab. Now open the attribute table of the vector layer either by selecting the View Attribute Table icon located on the toolbar, or by selecting View Attribute Table from the Data Layers menu. Click on the Feature Selection tab (see below). Each of the various modes differ in the way that the newly identified features are related to any features that are already selected. The default mode of Create new selection will simply ignore any existing selection and create a new selection set. There is also a drop-down menu containing the names of each of the fields within the attribute table. If you select a field from the field name menu, the name will automatically be inserted into the selection script text area. The selection script text area has an auto-complete feature that allows users to press Control (Ctrl) and the space bar (or Command + space on a Mac) after having typed one or a few letters of the field name and a helpful pop-up window will appear from which you can select the correct field name. This auto-complete feature is also available to help identify all of the methods that are associated with fields containing strings (e.g. startsWith, toLowerCase, equals, contains, etc.). If the selected field is a text string or is a numeric integer value with fewer than 300 unique values within the table these values will appear listed in the ‘Unique Values’ drop-down value. Selecting a unique value will result in it being inserted into the selection script text area as well. 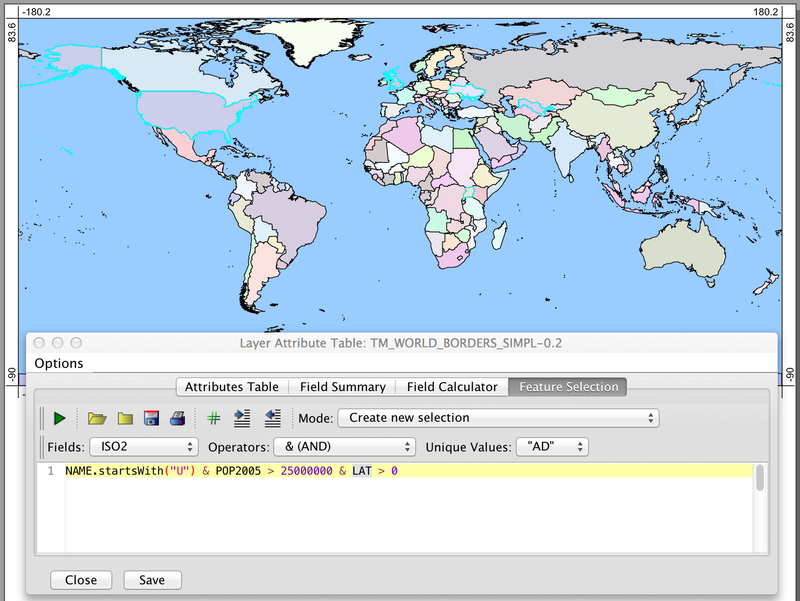 selects all features that have an attribute CLASS value of either agriculture or forest. After performing a selection, you will find that a filter has been applied to the attribute table such that only the selected features are displayed. The Options menu allows you to remove this filter, to copy the selected features to the clip board (they can then be pasted into a spreadsheet program as comma-separated values (CSV) text), or even save the features as a separate vector layer. 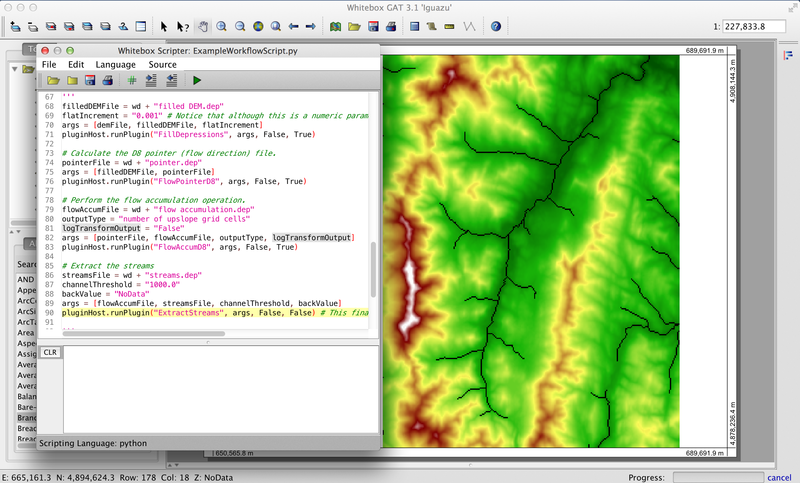 The selected features will also be rendered on the map with a cyan coloured outline. That’s it. I think it’s rather straightforward and hopefully you do too. As always, best wishes and happy geoprocessing. Have you been running into out-of-memory errors with Whitebox and are a bit confused because you have 8-16GB of memory in your computer? My guess is you’re running Microsoft Windows and the good news is there’s a solution to your problems. The default Java Runtime Environment (JRE) for download on the Oracle site for computers running Microsoft Windows OS is the 32-bit version even if you are running a 64-bit version of the operating system. This will severely limit the amount of memory that Whitebox can access. In fact, working with 32-bit Java will limit the memory that any Java program on your computer will see, but because Whitebox is used to process large spatial files, it’s particularly problematic for Whitebox users. The 32-bit version only allows Java to see about 1.1GB of your RAM which doesn’t give you much room to play with that wonderful satellite image or LiDAR file, does it? This can affect performance and can lead to out-of-memory errors when handling large files. Given the large number of Windows users, this affects many people (I’ll point out here that there is only a 64-bit version of Java for Mac OSX so this same problem simply doesn’t occur). 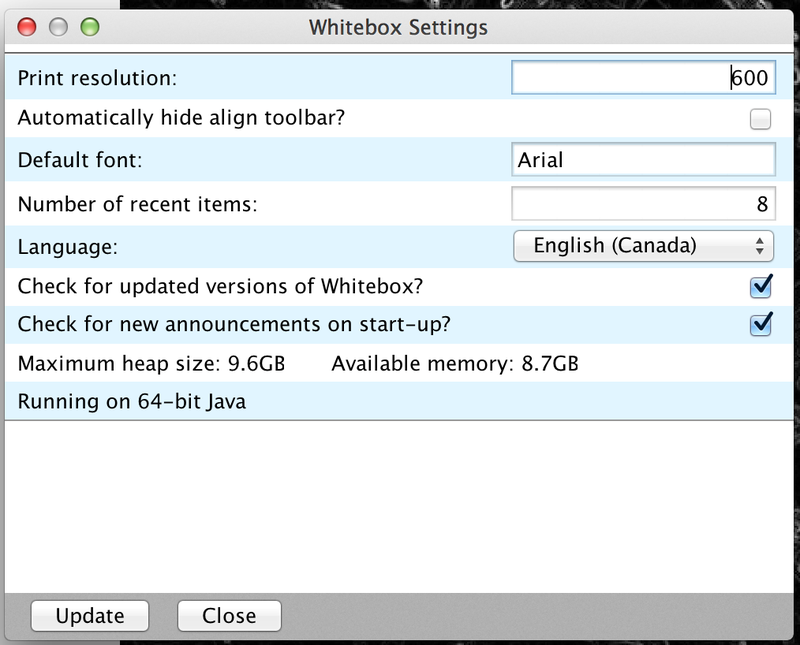 You can check what version of the JRE Whitebox is running under by selecting Options and Settings under the View menu.